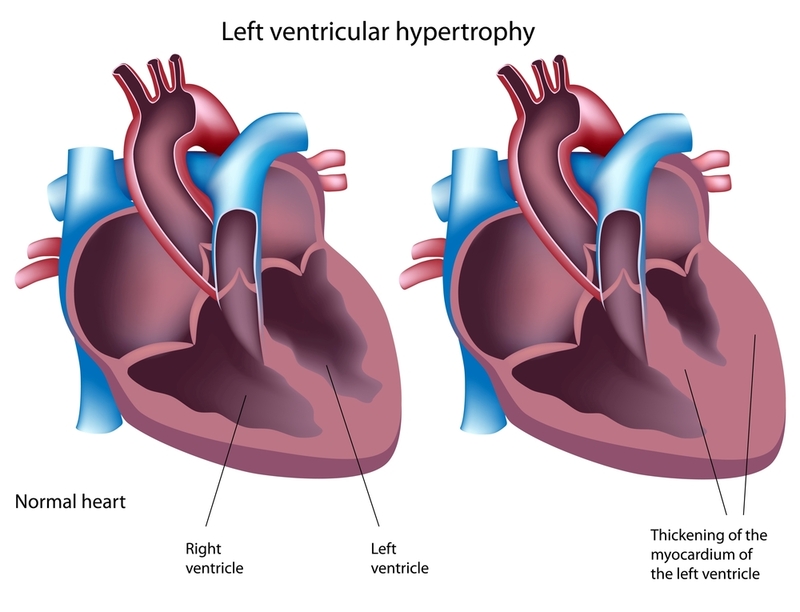 Hypertrophic cardiomyopathy (HCM) is an inherited condition. It leads to abnormal thickening of the heart muscle, most often of the left ventricle (the main pumping chamber of the heart). The thickened muscle creates problems because it causes the heart to work less efficiently. Therefore, some people may experience chest pain, shortness of breath, dizziness, fainting episodes or palpitations. Occasionally, the disease may cause sudden death. In adults, the walls of the left ventricle are usually 7 to 10 mm thick (can be thicker at post mortem/autopsy). To be diagnosed with hypertrophic cardiomyopathy the walls need to measure 15 mm or more. If you have a family member with HCM then to walls need to measure 13mm or more. The wall thickening is often unevenly distributed, unlike in people with high blood pressure. This is illustrated in the diagram below. In about 25% (1 in 4) of people with hypertrophic cardiomyopathy there is obstruction to the blood being pumped out of the heart because of the thickened muscle. This is known as the obstructive form of hypertrophic cardiomyopathy (sometimes referred to as HOCM). It is thought that up to 1 in 200 people have hypertrophic cardiomyopathy. Many people with HCM never have any symptoms. Tragically, in some cases the first sign of the disease is sudden death especially in young athletes. Therefore, if you have a family history of hypertrophic cardiomyopathy it is very important that you undergo clinical screening by a cardiologist. Hypertrophic cardiomyopathy is inherited as an autosomal dominant disease (see Genetic Inheritance and Testing for more information). 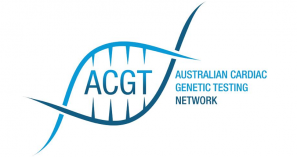 Genetic testing for hypertrophic cardiomyopathy is commercially available. It involves testing 10 genes commonly associated with causing HCM, and in about 50-60% of families the gene alteration (or “mutation”) will be identified. In the remainder, a gene alteration likely exists but in a gene that was not tested or is yet to be discovered. More research is required in this field. Beta-blockers are very commonly used in the general population to treat high blood pressure. They are used in HCM patients to slow the heart rate and reduce the effect of sudden exertion or excitement on the heart. As beta-blockers make the heart beat slower, it allows blood to completely fill the chambers before it is pumped out, leading to improved heart function. Examples include Metoprolol, Atenolol, and Nadolol. Warfarin is a common drug used in people who have atrial fibrillation. Approximately 25% of HCM patients will develop atrial fibrillation, and will require warfarin therapy. Warfarin is a blood thinning medication that prevents blood clots forming. When a heart is in atrial fibrillation, it does not effectively pump all of the blood out of its chambers, leading to clots which can then break away and travel to the lungs (pulmonary embolism) or brain (stroke). Implantable defibrillator: Your risk of sudden death is also something that your cardiologist will assess. If your cardiologist believes you may be at increased risk of dying suddenly, he/she will often advise an automatic implantable cardioverter-defibrillator (AICD). This is a device (similar to a pacemaker) that is inserted into the chest with leads extending down in to the heart. The AICD monitors the heart’s rhythm and if it becomes abnormal (the type of heart rate that occurs during a cardiac arrest), it will deliver an electric shock to revert the heart back to a normal rhythm. These devices have revolutionised the management of patients with HCM as it is the only therapy proven to stop people dying suddenly. As your cardiologist determines your level of risk based on certain criteria, you should report any new symptoms or events to your cardiologist immediately, including black-outs or if a family member passes away unexpectedly. One of the most difficult aspects of HCM is the advice to avoid high level, competitive sports. Competitive sports include those that require significant exertion, for example: touch football, basketball, netball, squash, running and even social games that you may not think are too strenuous. We recommend people avoid competitive sports because it has been observed that a large number of sudden deaths in people with HCM occur during or just after exercise. While high-level exercise should be avoided it is still important to maintain a healthy lifestyle. Regular light exercise, such as walking, is good for your heart and general health. Direct relatives of someone who has been diagnosed with HCM should have their hearts checked by a cardiologist, which is known as Clinical Screening. Direct family members include children, brothers and sisters, and parents. As HCM is an inherited heart condition, these family members generally have a 1 in 2 (50%) risk of also carrying the gene and are called at-risk relatives. We rely on this information being passed on within a family. Therefore, we ask you to encourage any at-risk relatives to arrange an appointment with a cardiologist. We know there is a wide range of symptoms seen even within a family – some family members have little or no symptoms while others have the most serious outcomes of heart failure and sudden death. So even though an at-risk relative may feel healthy and well, it is possible they could have mild disease. If this is the case, they may not necessarily need to start any treatments but they would then know that their children are at-risk and could arrange appropriate medical screening for them. Please talk to the coordinator of a Cardiac Genetic Service near you for more information or to organise a ‘heart check’. HCM is one of the diseases being investigated by the Registry. We aim to enrol every family in Australia with HCM. Find out more about the Registry or enrol yourself or your family by emailing the Registry Coordinator.